FAVI ENTERTAINMENT is mobile technology manufacturer that is around the market for 8 years. They have caught attention of many tech expert magazines and tech portals with quality and design of their products. FAVI ENTERTAINMENT are manufacturing electronic devices for smartphones, tablets and tvs. Their product line include bluetooth keyboards, portable speakers and other gadgets. 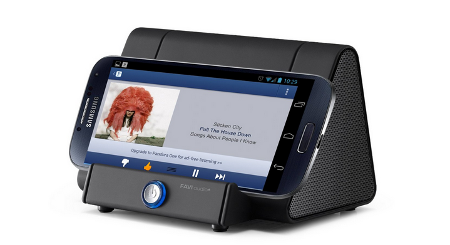 This android speaker dock is unique in a way it connects portable speaker to android smartphone. We are used to auxiliary cable, bluetooth or wifi connections, but FAVI audio uses their set-to-connect wireless technology, which uses magnetic field and plays music from your smartphone, when you place it into the portable speaker. Lets see what else this portable speaker can provide. Favi audio portable speaker looks and feels good while holding it in hand. The speaker itself is light and weighs only 0.53 lbs (240 g). Speaker device works not only as portable speaker, but also as smartphone holder. It will work with practically any android smartphone, you can simply put it into the front projection of the dock. Holder will be useful when you want to watch movies or talk on the skype from the phone, because you won’t need to hold phone into your hand, but it can sit into the wireless speaker. In front of the device there on/off button. Around that button there is an indicator light that shows the power status of the wireless speaker – on and not charging, charging, off and not charging. On the back of the speaker there is a Micro USB socket for device charging. Device comes in black and white colors. While playing music, there is a colored flashing light under the speaker, which flashes in the music rhythm. This is a fun addition to the speaker, and makes it more attractive in the dark. The dimensions of this portable speaker are 3.6×5.1×3.4 inches (9.1×12.9×8.6 cm). 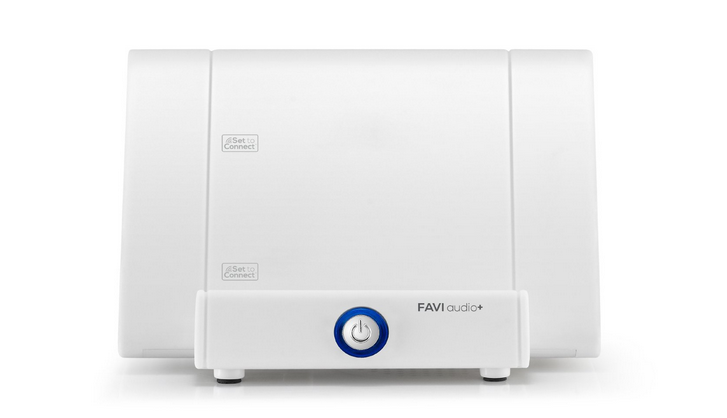 FAVI audio portable speaker has got single 3W speaker. The speaker is able to produce up to six times louder sound than regular smartphone speakers. The sound quality is also significantly better than mobile phones sound quality and you will be able not only to watch movies or talk hands free on the phone, but also enjoy quite good sound quality from such a small speaker, when listening to your music playlist or radio. Without taking into account the small size of this portable wireless speaker it is has got some sound enhancement features like treble and bass boost. Of course, you will not hear some deep bass or the clearest sound quality from this cheap speaker, but it is decent enough to intensify the loudness and sound quality of your phones speaker. 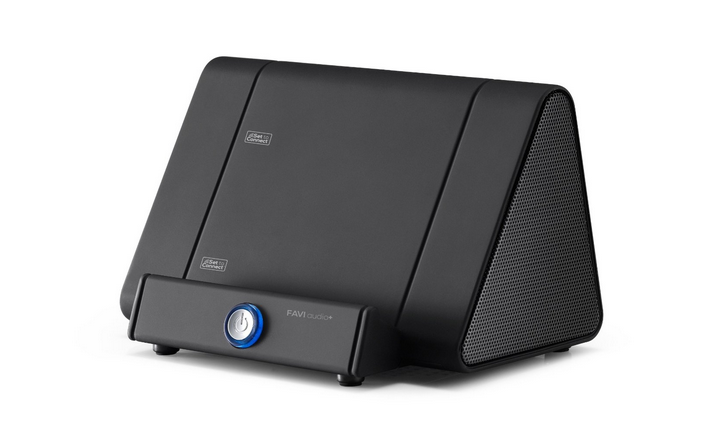 FAVI audio wireless speaker is powered with two Lithium ion rechargeable batteries. Batteries comes included with the device, but when they wear out, you can get Lithium ion batteries practically any larger electronic or online store. Capacity of the battery is 750 mAh. The average music playback time we could get from this portable speaker was about 7 hours. Batteries get fully charged in under 2 hours. 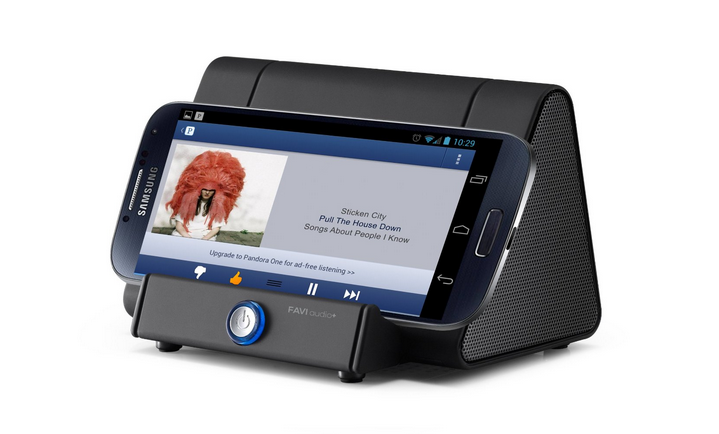 FAVI ENTERTAINMENT audio docks main feature is the set-to-connect wireless pairing technology. This technology works with electromagnetic induction. When phone is placed into the speakers dock both devices get connected automatically. Wireless speaker works like sound amplifier for smartphones speakers, so no other type of connection is needed. We have not seen this technology used in other type of android docking stations that we have reviewed. The wireless speaker allows to amplify the sound up to six times of smartphone speakers. This technology works with all android smartphones. Portable speaker comes with micro USB charging cable and a quick start guide. FAVI ENTERTAINMENT gives this portable speaker a 1 year warranty. FAVI audio portable speaker uses a unique set-to-connect wireless pairing technology, so there is no need for wired, bluetooth or wifi connection to be able to listen to music. This portable speaker is useful for listening to music or radio, watching movies or internet calling. This device is small and ultra portable and works on batteries with more than 6 hours of music playtime. It looks good in both white and black colors. It is such a portable and light speaker that you can take it practically anywhere you go. You can place it into your pocket or backpack and listen to music in your home, office or take it with you outside and enjoy your favorite songs.